Saphenous veins are used for coronary artery bypass grafting (CABG) surgery. However, progressive neointimal hyperplasia contributes to considerable vein graft failure. Dr. J.H. Alexander, from Duke Clinical Research Institute, sought to assess the efficacy and safety of pretreating vein grafts with edifoligide for patients undergoing CABG in order to determine if it may prevent neointimal hyperplasia and vein graft failure. 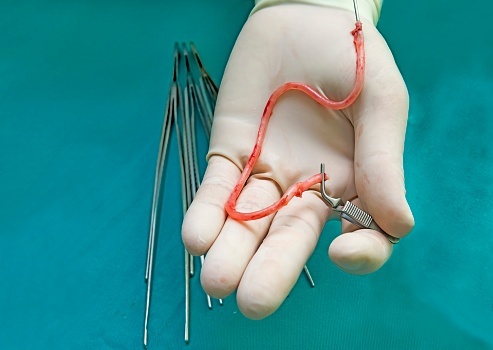 A phase 3 randomized, double-blind, placebo-controlled trial at 107 U.S. sites with 3,014 patients undergoing primary CABG surgery with at least two planned saphenous vein grafts was conducted. Vein grafts were treated ex vivo with either edifoligide or placebo in a pressure-mediated delivery system. The first 2,400 patients enrolled had angiography at 12 to 18 months post-op. The primary efficacy end point was angiographic vein graft failure (equal or greater than a 75% vein graft stenosis) occurring 12 to 18 months after CABG surgery. Other end points included more angiographic variables, adverse events through 30 days, and major adverse cardiac events. A total of 1,829 out of 1,920 patients (80%) underwent follow-up angiography. Ninety-one patients (20%) died prior to angiography. Failure of at least one vein graft is quite common within 12 to 18 months after CABG surgery. Edifoligide is no more effective than placebo in preventing these events. The researchers advised that longer-term follow-up and additional research are needed to determine whether edifoligide has delayed beneficial effects, to understand the mechanisms and clinical consequences of vein graft failure, and to improve the durability of CABG surgery.